The unemployment rate hasn’t been this low in over five years. On top of that, the number of new jobs created in April is the largest monthly increase since February 2012. Is it time to pop the champagne corks and celebrate the economy’s new found life? Still, we must remember that many things aren’t what they appear to be on the surface. Sometimes it takes a scratch below for a whole new perspective to be revealed. Take President Obama, for instance. He seems like a good enough guy on the surface. Someone well suited for running the local rescue mission or public library. But make him President of the United States and he’s transformed into an utter dillweed. Before long he’s making decisions about what doctor you can see and his wife’s telling the school cafeteria what they can serve your kid for lunch. These are shortcoming we’d have never known about this couple if they weren’t living in the White House. Yet now they’re on display for all of us to more fully appreciation. Like the President and the First Lady, the jobs numbers have some deficiencies that warrant further discussion. We’re not getting at the quantity of new jobs. Nor are we getting at the sagging participation rate. “According to new data derived from the monthly CPS, median annual household income in March 2014 was $53,043, about 0.7 percent lower in real terms than the February 2014 median of $53,435.” Moreover, this means, median household incomes are still down 4.4 percent from December 2007. 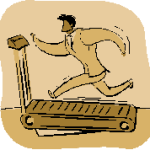 Alas, households have been running on the treadmill for five years straight and they have nothing to show for it…with the exception of, perhaps, frayed nerves, gray hairs, and a balance sheet teetering on insolvency. This is with the greatest amount of monetary and fiscal intervention into the economy the nation has ever experienced. Such is the plight of the new economy…work more, earn less, and never retire. This entry was posted in Economy, MN Gordon and tagged bureau of labor statistics, jobs, labor department, president obama, retirement, saving. Bookmark the permalink.